Read the Times’ rave review of Toms River. And check out the paperback edition, featuring a new afterword by Dan. 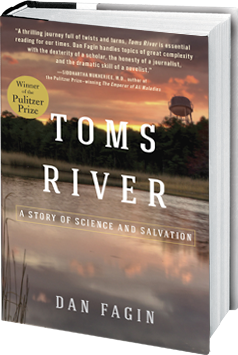 The story of a small town engulfed by industrial pollution, Toms River melds hard-hitting investigative reporting, a fascinating scientific detective story, deep historical research and unforgettable characters into a sweeping narrative in the tradition of A Civil Action, The Emperor of All Maladies, and The Immortal Life of Henrietta Lacks. Watch and hear Dan’s talks and media appearances, and see where he’ll be next. In his keynote address at the Festival for the Earth in Venice, Italy, Dan speaks about knowledge, faith and the power of true stories well told. Delivering the J. Roderick Davis Lecture to a crowd of more than 500 at Samford University in Alabama, Dan described urgent, and related, crises in journalism and the Earth’s environment. In an interview with the National Observer of Canada, Dan talks about the promise and perils facing science journalism in an age of science denial. Dan talks about journalism, libraries and the 30th anniversary of the New York Public Library’s Bernstein Book Award for Excellence in Journalism. Dan talks about denialism, Toms River and the future of science journalism on public broadcasting’s “Story in the Public Square”.